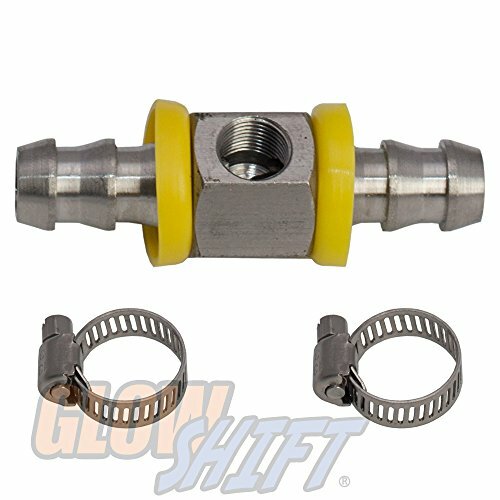 GlowShift's 3/8" Fuel Line Fuel Pressure T-Fitting Adapter allows you to tee off the fuel line for reliable fuel pressure readings directly from the source. 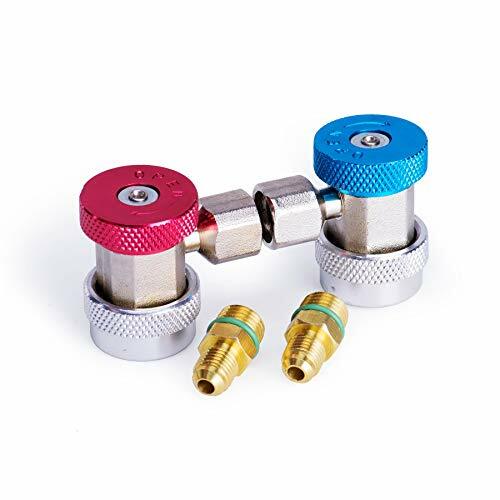 This fuel line adapter features 3/8" barbed push lock fittings, a 1/8-27 NPT port for easy installation of a fuel pressure sensor and 2 hose clamps that secure the line to the fitting. This T-fitting adapter is manufactured from 304 stainless steel that prevents corrosion over long-term use. Fitting is designed for 3/8 I.D (Inner Diameter) Fuel Lines. GlowShift includes installation instructions, free lifetime technical support and a one year limited warranty with each purchase. 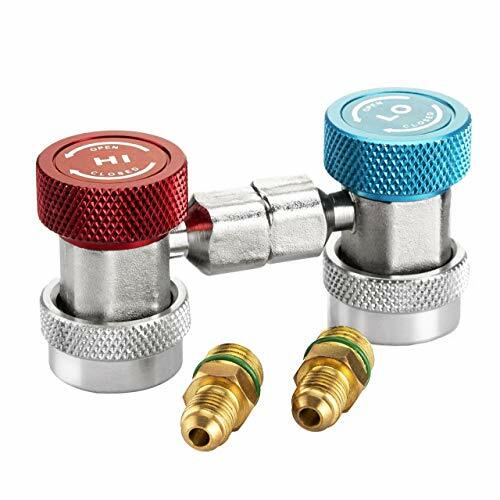 Adjustable Cool Gas Quick JointWork with Car Air Conditioner Refrigeration -Side fitting for AC manifold gauge set/R134A type -High and low sets Blue: Low side quick connector/adapter(1/4" SAE male flare) Red: High side quick connector/adapter(1/4" SAE male flare) Features: 1. 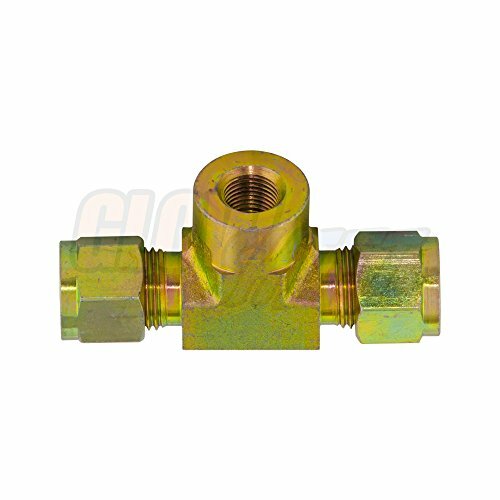 For R134A service ports quick coupler adapter, 1/4" SAE male flare. 2. Universal Compatibility: The adjustable Adapter Fittings provides universal compatibility for all models. 3. Contain with Low side & High side. 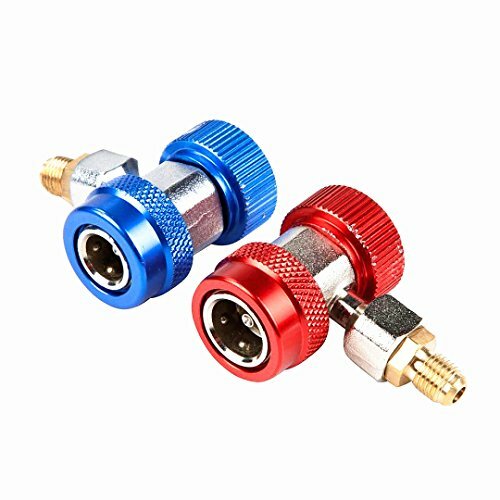 Blue: Low side quick connector/adapter; and Red: High side quick connector/adapter. 4. Accuracy and Durability: Accurate snap lock & knurled grip ring for easy operation, detachable adapter for longer maintenance. 5. How to Use: Connect bottoms with vehicle's R134A service port; connect the ACME adapter with the refrigerant hose; turn on/off the switch at top to turn it on/off. 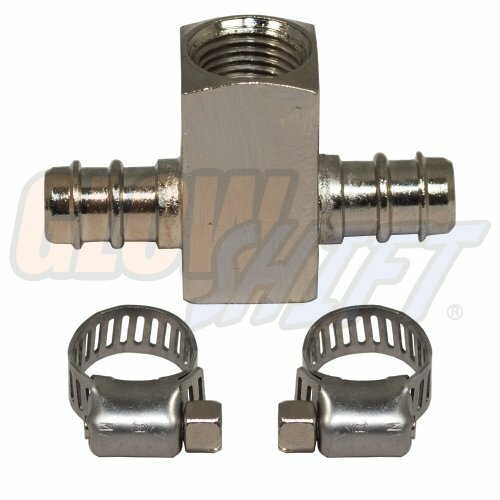 GlowShift's Boost T-Fitting Adapter allows you to avoid drilling and tapping into your intake manifold by cutting the MAP line and inserting the T-fitting in the two cut ends. The two included hose clamps allow you to tighten the two ends of MAP line to the T-fitting for an air tight seal which results in extremely accurate boost pressure readings. The T-fitting features a 1/8-27 NPT Female thread that can securely hold an electronic boost pressure sensor or compression fittings that will run the boost line directly to the back of the gauge. 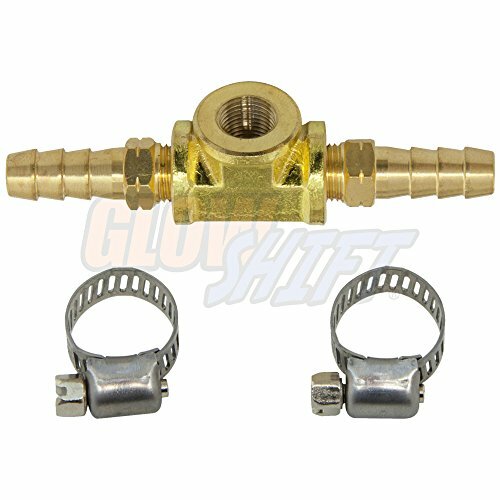 GlowShift's 1/2" Fuel Line Fuel Pressure T-Fitting Adapter allows you to tee off the fuel line for reliable fuel pressure readings directly from the source. This fuel line adapter is the perfect accessory for any truck running a stock 1/2" fuel line or an upgraded aftermarket lift pump. 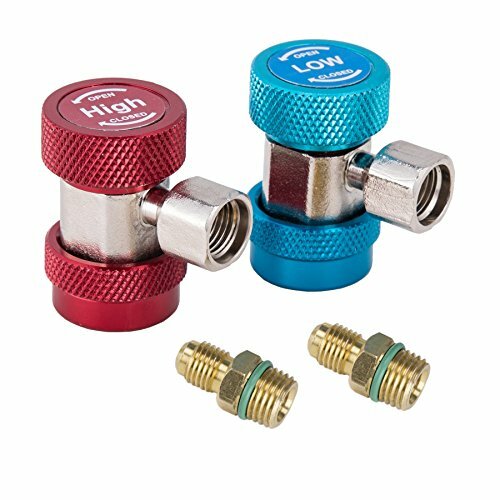 This fitting features 1/2" barbed push lock fittings, a 1/8-27 NPT port for easy installation of the fuel pressure sensor and 2 hose clamps that secure the line to the fitting. This T-fitting adapter is manufactured from 304 stainless steel that prevents corrosion over long-term use. Installs to 1/2" or 12.7mm Inner Diameter Fuel Lines. GlowShift includes installation instructions, free lifetime technical support and a one year limited warranty with each purchase. 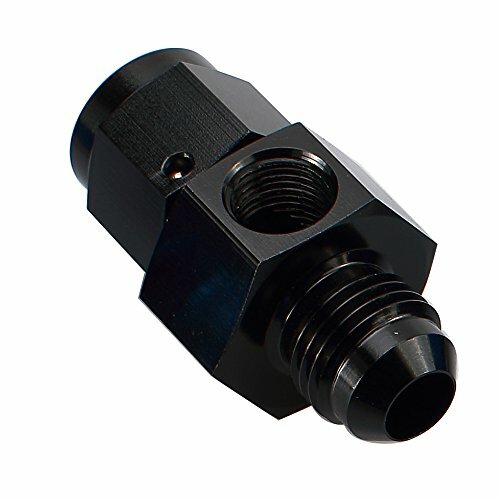 Black Aluminum Anodized -6 AN Male to Female -6 AN with 1/8" NPT Gauge / Gage Port Adaptor Fitting. Sniper adapters are precision machined to assure a proper fit to Sniper hose ends. And, being hand polished and bright dip anodized means they look good while doing it.